Skill Level: Intermediate to advanced. Must have basic knowledge of right-angle weave. Come and spend two days with NanC Meinhardt and explore her signature technique, Free-form right angle weave. You will learn how to cover molded pieces using her technique to pick up the slightest nuances of shape and form. These cascading beaded shapes dangle from the ends of a lariat which is constructed of……you guessed it……yet another adaptation of NanC‘s right-angle weave. All you need to bring to class is a basic knowledge of right angle-weave and the desire to explore. 5 or more colors of size 11 round seed beads and/or 5 or more colors of size 14/15 round seed beads. The size 14/15 seed beads will give you much more detail on the forms than the size 11s. I use a combination of both in my pieces. 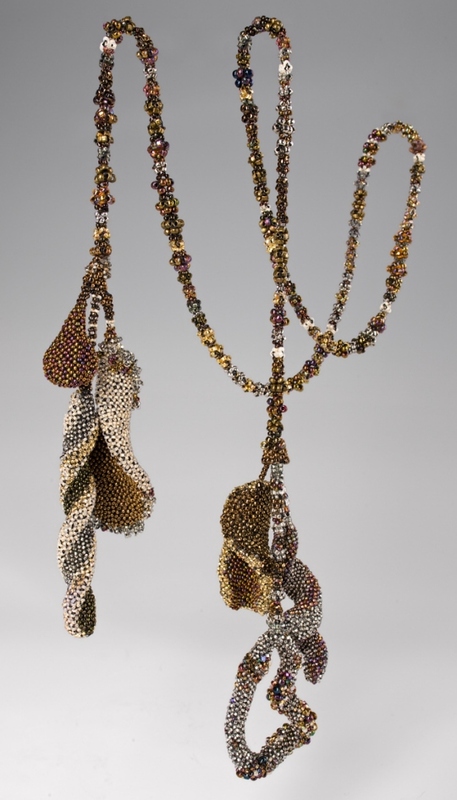 I like to use the bronze, silver and gold tones of seed beads on my forms. You may do the same or choose a palette for yourself. Magnifying glasses or visors. Seeing is very important! Black silamide thread A or black Nymo size D beading thread. We will not be using Fireline for this project. You need black thread! Power zap is optional but a good idea to have with you. Beads for the rope lariat otherwise known as: "Whistling with your mouth full of crackers."